A multi-billion-dollar seawall is among climate adaptation options under consideration for the iconic coastal city. Back in 2012, Superstorm Sandy offered a heads-up on hurricane risks – killing 43 people and causing $19 billion (U.S.) of damage in New York City alone as it pulled in a surge of seawater that rose more than 1.5 metres above ground level in many neighbourhoods. If Sandy’s remnants hadn’t missed Boston’s high tide by a few hours, a similar storm surge would have swept across low areas of the city. Like other coastal metropolises, Boston is working on projects large and small to meet these threats. 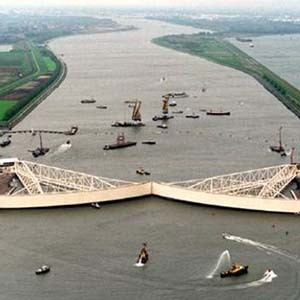 Most dramatically, the city is considering building a giant seawall across the harbour, somewhat like the huge barriers that now protect New Orleans as well as Rotterdam and a few other European cities. Boston is enjoying good economic times. Construction is booming along the harbour, which was cleaned up by a multi-decade megaproject that was officially completed in 2016. There is also a working political consensus to take on climate change that extends to the state level, where the governor last year signed an executive order to plan for climate change mitigation and adaptation. When European settlers arrived, Boston was all but an island. More than half of the modern downtown is built on tidal land, and some parts routinely flood even in calm weather. Like the rest of the northeastern coast, the area has been subsiding very slowly into the sea, about 23 centimetres during the 20th century. Now the city expects much quicker sea level rise, with 0.9 metres commonly expected by 2070 and perhaps more than three metres by 2100. 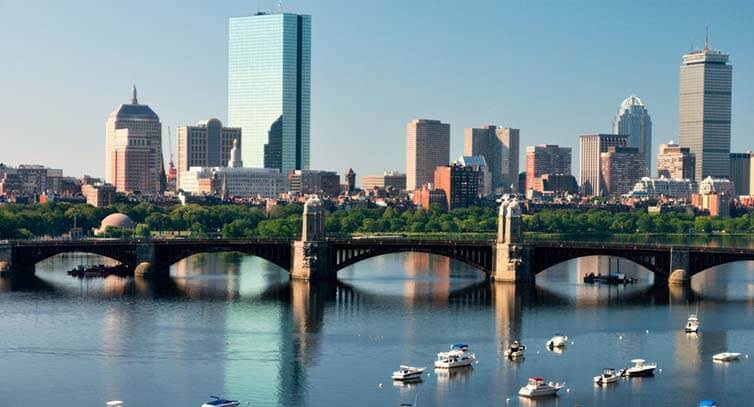 The city presented its current framework for protecting its shores in its Climate Ready Boston plan in December 2016. The plan sets out many options to protect against storm surge, sea level rise and intense rainfall like that which swamped Houston during Hurricane Harvey. Options for resilience range from reconfiguring waterfront land as green space to installing specialized protections for key infrastructure to building berms, dikes, dams, temporary flood barriers and buildings that can withstand deep flooding. The plan does not, however, follow up on a 2014 proposal to start cutting canals. A few new facilities are taking on storm surges as an individual challenge. The poster child for this response is the Spaulding Rehabilitation Hospital, which opened in 2013 with generators on the roof, barriers and berms to hold off floods, and even a roof over the entrance that can act as a dock if water gets that high. 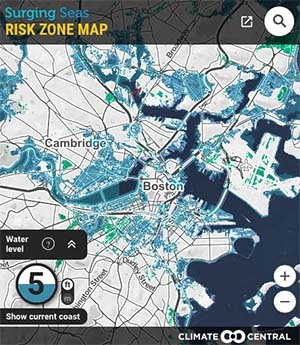 But as a surge could simply flood most of Boston’s buildings and key infrastructure on or near the waterfront, various proposals for seawalls have been floated for decades. Currently, researchers at the University of Massachusetts Boston are putting together a feasibility study of two alternative barriers. One would stretch six kilometres between Winthrop and Hull, two nearby towns that bracket the entrance to the outer harbour. The other and much shorter one would cross the entrance to the inner harbour from Logan Airport to South Boston. In 2014 Sasaki Associates, a planning and design firm in Watertown, Massachusetts, gave a first-guess price tag of $10 billion (U.S.) for the larger barrier and a quarter of that for the inner-harbour barrier. Kirshen says the upcoming report will provide wide ranges of estimated costs, reflecting uncertainties about the local seafloor and many other factors. But a seawall must be weighed among other options to protect the metropolis, experts agree. The solutions may include approaches that environmental groups might have opposed until recent years, such as building barriers, she notes. The seawall is a popular option, at least before details emerge about funding and impacts, because for some people it might push the solution literally out of sight. “There’s a human tendency to want a quick fix that maybe doesn’t impact you directly,” Abbott says. The city needs a barrier, but that’s only one part of the resilience problem and far from the most urgent, says Alan Berger, MIT professor of landscape architecture and urban design. Moreover, a seawall wouldn’t help with chronic tidal flooding or the coming more frequent and intense rainstorms that can also flood the city. It’s more urgent, Berger says, to build a first line of defence with flood walls around the city’s most critical infrastructures in vulnerable places. This fall the city will propose specific local projects for the areas most vulnerable to chronic tidal flooding. These initiatives already are going hand-in-hand with community involvement – for instance, open houses on climate change adaptation, including the opportunity to play a game that examines waterfront protection options. Such conversations are taking place elsewhere along the coastal United States where other sea barriers are proposed. One is the long-contemplated “Ike Dike” around Galveston Bay and Houston, which is gaining acceptance after this summer’s disasters. Another, a two-wall New York barrier, would close both the main entrance to New York Harbor and the East River. The main seawall, Golden says, would be a five-mile-long, 30-foot-high barrier from Sandy Hook in New Jersey to Queens in New York City. “For the next 100 years or more, you close it at low tide before the next storm, and it’s low tide along 820 miles of shoreline in the metropolitan area,” he says. Such a barrier system would supplement a range of other resilience projects underway or in planning. As Harvey, Irma, Maria and Nate have smashed in, “it’s an arresting moment, and it focuses our nation on our exposure and our vulnerability to these storms,” says Erika Spanger-Siegfried, senior climate and energy analyst at the Union of Concerned Scientists in Cambridge, Massachusetts.